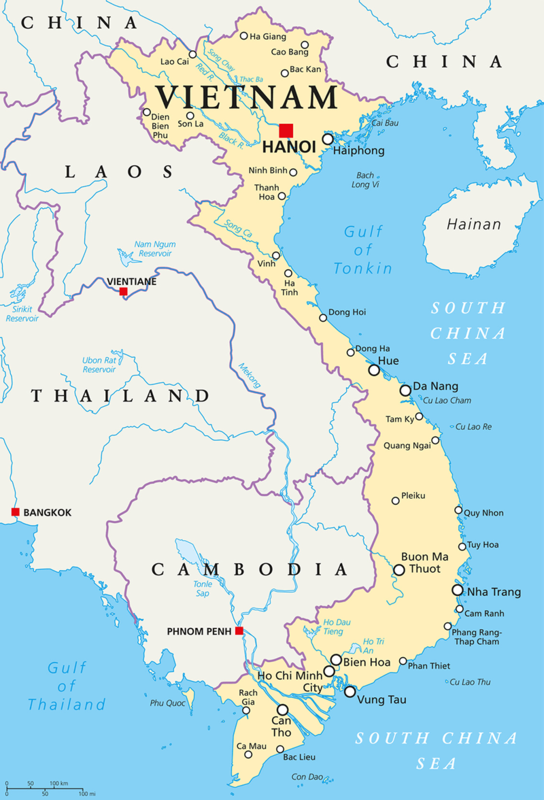 Vietnam in Southeast Asia on the South China Sea. It is known for its beaches, rivers, Buddhist pagodas and bustling cities. It is an exotic and compelling destination, with a unique and interesting history. Previously a divided Communist country, it re-united in 1975. Since which time, Vietnam has gone from strength and has managed to put its brutal history behind it. The north and south remain very different in feel and atmosphere. The north is more conservative with law-abiding and more reticent citizens, the south is the growth driver with a more flamboyant, dynamic and entrepreneurial population. The big cities of Hanoi and Ho Chi Minh City (known locally as HCMC) are busy and mesmerising. Hanoi, the capital, pays homage to the nation’s iconic Communist-era leader, Ho Chi Minh, via a huge marble mausoleum, and remnants of the Vietnamese War, such as the “Hanoi Hilton”, where US prisoners of war were imprisoned. HCMC (formerly Saigon) has French colonial landmarks, plus Vietnamese War history museums and the Củ Chi tunnels, used by Viet Cong soldiers. Outside of the cities you will find the contrasting landscapes of lakes, mountains, paddy fields, rivers, karsts (rounded rock formations jutting out of the earth/sea) and forests. Cycle, walk, drive, float or row around these fascinating places at your leisure. All this with the added interest of its military and French colonial history, which combine to make this a fascinating country to visit. The street food is a joy and worth sampling wherever you are. Key destinations include Hanoi, the Ho Chi Minh Mausoleum, the Metropole Hotel for drinks, the Hanoi Hilton, the bustling old quarter, and the Water Puppet Theatre. Ha Long Bay for its unique landscape with the wonderful karsts. Sa Pa in the north for the incredible rice paddy terraces. Hoi An, the well-preserved ancient town with colourful French houses and pagodas. Hue, the former royal capital of Vietnam, situated on the border between old northern and southern divide, and as a result, suffered quite a lot during the war between the north and south of the country. The 19th century Citadel is worth a visit. In HCMC, there are some interesting colonial and communist buildings, such as the Cantonese Thien Hau Pagoda, the War Remnants Museum, ex-Presidential Palace, Notre Dame Cathedral and a gateway to the mighty Mekong River.